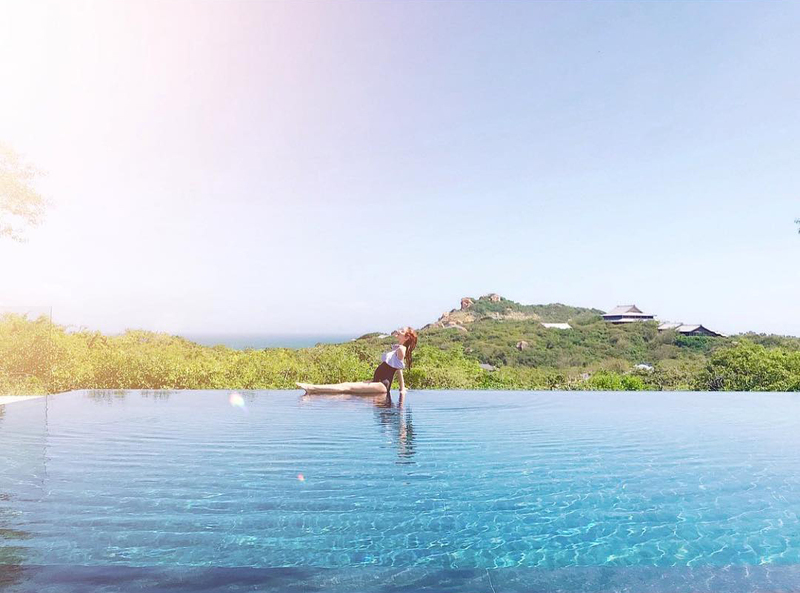 Working while being pregnant isn’t an easy task, and perhaps that is the reason why Grace Chan (陳凱琳) decided to do something chill and relaxing for her “babymoon” vacation. Grace then shared another picture showing her belly bump. “When he tells you he loves your pregnancy glow,” she wrote. The Forgotten Valley <平安谷之詭谷傳說> actress, who is married to fellow actor Kevin Cheng (鄭嘉穎), announced in November that she is expecting her first child. At an event she attended in January, she shared with the press that she has already gained 20 pounds. It’s not good to go for babymoon if you intend to take a plane there. Just think of the radiation. It’s not very minimal up there. Omg!! Amanoi, very very luxurious resort. I can’t help notice stronger “Indian” features, especially with her make up toned down during pregnancy. Although both parents denied any Indian ancestry, I recall seeing a family photo of her brother and he definetley has more dominate Indian features. 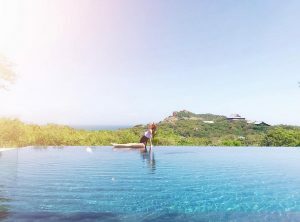 Btw – the resort is gorgeous..
@marquis i have the same feeling about that since “Raising the bar” is airing in my country, literally see that indian features in Grace. @marquis maybe they’re both adopted by their adopting parents who knows right? I also saw a few pictures of her brother he has nothing look like Chinese so definitely a India person. In my opinion maybe the their parents couldn’t have any children so they went to India to adopt them? I mean I could be right you never know what’s behind their story plus their parents both look alots like Chinese that’s why I think they’re adopted. @cutie777 you could be right. If I remember correctly, both she and her brother are twins but her brother looks 90% Indian. There is no shame to it either..as Indians have nice facial bone structure. @marquis honestly, she and her brother look nothing like their parents and elder sis. Oh boy she must be crazy or something why would you want to travel on a plane while you’re pregnant? Don’t she know what’s safety mean? And I don’t even see Kevin in the pictures with her so I hope she don’t just travel alone. @cutie777 yes in her advanced stage it’s risky to fly and to a place like Vietnam too. But let’s not forget that she also flew in her first trimester to Bali for her wedding so hmmmmm…..
@cutie777 she’s only 6 months along so if there is no complications then can travel up to 7-8months. Pregnant women fly all the time. I travel for work so see them often. That’s why babymoon trips are so popular. It’s a safe mode of transportation. @coralie doesn’t the article state that the risks are inconclusive? They don’t want you travelling in your last mth in case you go into labour earlier. But in terms of risks such as radiation, I think it’s no different from standing in front of a microwave lol. Howver, if you are labelled as a high risk pregnancy, then all flight should be avoided. But then, I’m sure her doctor probably gave her the green light to fly since as first time parents they will probably be more cautious. @marquis microwave radiation & upper atmosphere radiation are not the same. if anyone ever uses Geiger counter while they’re up in the air, they’ll notice the extreme spike in radiation when they’re there. it’s a thing, you can youtube it. anyways, i wouldn’t recommend women do any types of babymoon that requires air travel. but that’s me and my opinion. your take on it is that it’s safe. to each their own. Grace does remind me of Michelle Saram back in the days. Both are gorgeous ladies with a huge smile. It’s unlikely for Grace to say anything even if her parents come clean someday. That’s a private issue. Khloe Kardashian never revealed her true paternity, or maybe was too scared to, so it’s unlikely we’ll ever know. That resort looks amazing and Grace is glowing! There are reports saying her due date is in February/March. She should be closer to 8 months then.